Boats aren’t usually my thing (despite spending four days on a houseboat earlier this year). But when I saw Maggie May and Maddy on the Chicago Fireboat Legend Cruise in Sturgeon Bay, Wisconsin, I knew this one was where I wanted to be. 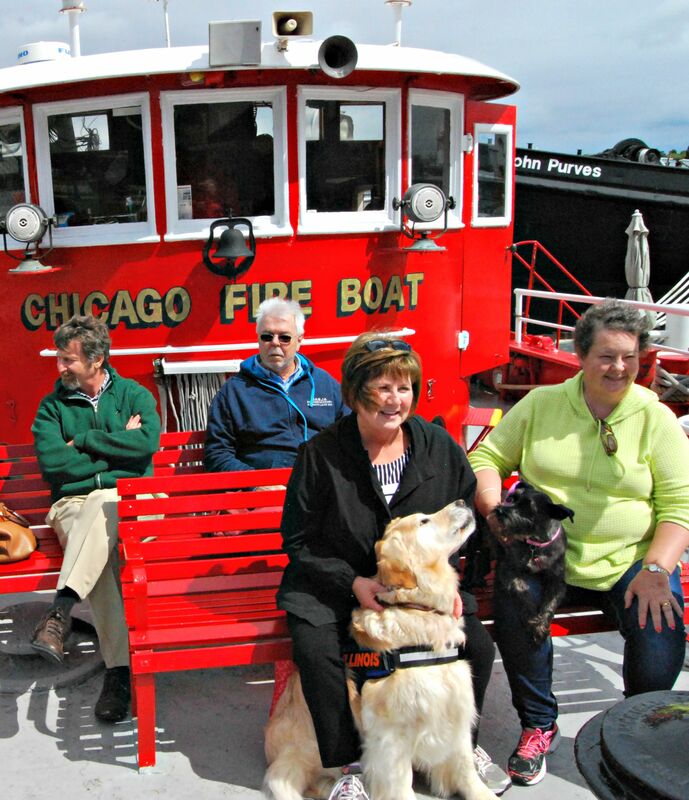 The Chicago Fireboat tour is dog friendly and the perky Schnauzer Maggie and relaxed Golden Lab Maddy reminded me of Victor and Sasha – or a dynamic duo ready for cop show status. Fortunately, we don’t need cops. Or firefighters. Just a jacket and one-and-half hours of time to enjoy the view. This boat cruise leaves from the Door County Marine Museum dock twice a day July and August 10:30 am and 12:30 pm. (Sunset cruises are available by reservation). 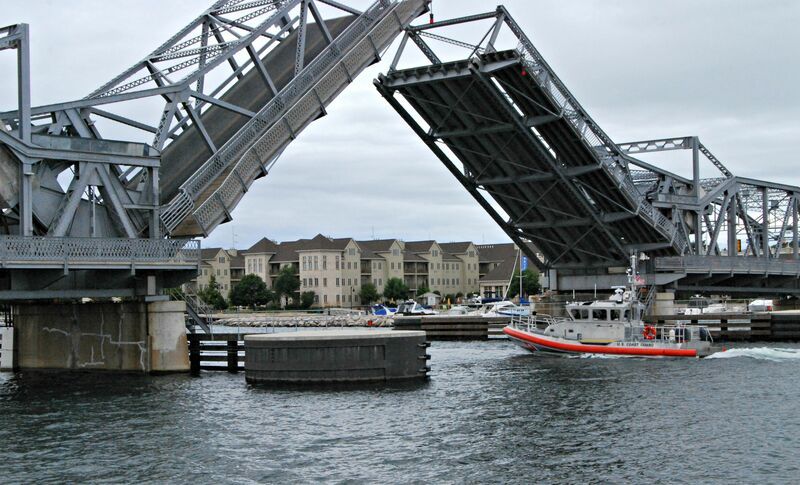 The novelty of the narrated tour, which takes you through the canal connecting Green Bay with Lake Michigan, is … you’re on a former fireboat that actually fought maritime blazes. Built in 1937 and in commission until the 1980’s, this is a floating piece of history. … with some stuff missing: some equipment has been removed to accommodate passengers who want to experience Door County, Wisconsin from the water. First, the Door County Peninsula is surrounded by it. Second, it’s how the area got its name. Before the canal was built in the late 1800’s, ships had to travel around the dangerous northern tip of the peninsula to get into Green Bay. The volume of shipwrecks at there led to the nickname ‘death’s door,’ hence Door County. You can see shipwreck pieces at Whitefish Dunes State Park or view the area in clear-bottom kayaks available for rent from Door County Shipwreck Kayak Tour. But today isn’t about the wrecks. It’s about the floating ship. And the dogs. 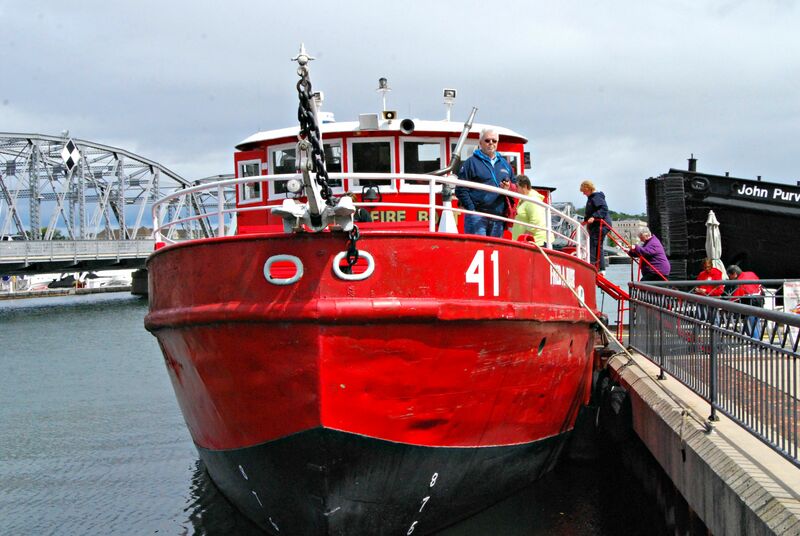 The Chicago Fireboat Legend Cruise isn’t the only dog friendly activity in Door County. There’s a state park with a dog beach, hiking trails, kayak rentals you can take the dog on, and even a restaurant with a dog patio and menu. (More on these in upcoming posts). Some resorts are dog-friendly such as Ridges Inn and Suites in Bailey’s Harbor, but strangely not The Landmark Resort (condo rentals) in Egg Harbor where the predominate ‘No Pets’ signs suggest many people travel through these here parts with dogs. 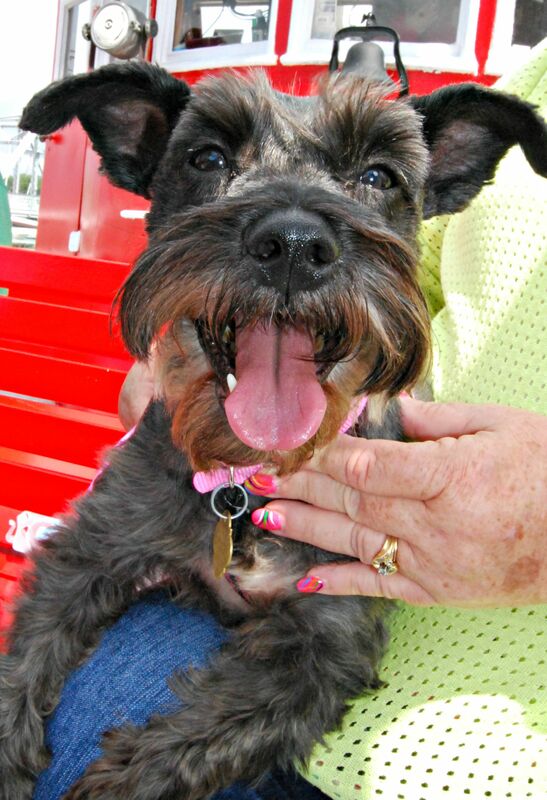 But today, Maggie and Maddy are welcome aboard the Chicago Fireboat Legend Cruises and given a water bowl and treats. It’s Maggie’s first boat trip and she’s taking it all in while Maddy mostly sleeps. Meanwhile, the people huddle under provided blankets because today is unseasonably cold and wet. We travel under lift bridges; into Lake Michigan; passed the historic Sherwood Point Light House, built in 1883, automated 100 years later and still in use today; through the Sturgeon Bay Ship Canal and into Green Bay Harbor where enormous ocean freighters line the dock. We end where we started – at the Door County Marine Museum – and it just happens to feature a new exhibition called Sea Dogs. Stay tuned (or subscribed) for more Door County doggie adventure…. MORE: If you liked this, check out some dog train adventures here. TRAVEL GUIDE: Door County, Wisconsin is a peninsula on the east side of the state reaching north toward Michigan. You can hike in the Whitefish Dunes State Park; walk through The Ridges Sanctuary with two lighthouse range lights designed to guide boats into Bailey’s Harbor; and kayak, paddleboard and zipline at Rowley’s Bay across from the Rowley’s Bay Resort. STUFF: For a complete guide to Door County check out the Moon Handbook Guide here. What a great post! I’d love to visit Chicago and go on this boat tour. I’d be really interested in the Sea Dogs museum too, that must be so terrific if it’s completed by now. Thanks for sharing this. Thanks! It’s actually a fire boat from Chicago but now in the waters near Green Bay, Wisconsin. The owners have no problem letting dogs on board. It’s kind of fun to visit with other’s dogs while I’m missing mine. ← 9 things you need to know about Wiener dogs. First, they’re actually Dachshunds….